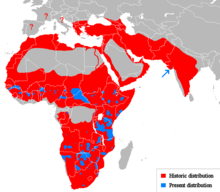 Distribution of Panthera leo in Africa and Eurasia, in the past and present. Lions have disappeared from North Africa and southwest Asia in historic times. Until the late Pleistocene, about 10,000 years ago, the lion was the most widespread large land mammal after humans. They were found in most of Africa, across Eurasia from western Europe to India, and in the Americas from the Yukon to Peru. The lion is now a vulnerable species. There was a decline in its African range of 30–50% over two decades in the second half of the 20th century. Habitat loss and conflicts with humans are the greatest causes of concern. Lions live for 10 to 14 years when they are in the wild. When they are captured, they can live longer than 20 years. In the wild, males do not usually live longer than 10 years. This is because wounds from fighting with other males make their lives shorter. They usually live in savanna and grassland. These areas do have bushes and trees, but lions are mainly adapted to catch prey on grasslands. Compared to other cats, lions are social. A group of lions is called a pride. In a pride of lions, there are related females, their young, and one or two adult males. Groups of female lions often hunt together. They have an archetypal roar which is used to communicate with other group members and warn different intruders of territorial boundaries. They have long, retractable claws which help the lion to grab and hold prey. They also have a rough tongue that helps them peel the skin of prey animals away from flesh and flesh away from bone. Across their belly, they have loose skin which allows the species to be kicked by prey with little chance of an injury. There are about 30,000 lions left in the wild in Africa. Only 350 lions are left in Asia. They live in the Gir Forest in the state of Gujarat, India. Lions hunt many animals, such as gnus and antelopes. Male lions usually weigh between 150 and 250 kilograms (330 and 550 pounds). Large lions have reached 250 to 270 kg (550 to 600 lb). Females (lionesses) are usually 120 to 182 kg (265 to 401 lb). Mature male lions are the only cats with a mane. Lions live in groups that are called prides. 10 to 40 lions may live in a pride. Each pride has a home area that is called its territory. Lions do not allow other carnivores(meat-eating animals) to hunt in their territory. A territory can be as large as 260 square kilometres (100 square miles). The lions' roar is distinct to each individual. It is used for territorial marking and warning off other lions in separate prides (or lone individuals). This however, is usually carried out by competing males. Lions are not as built for extreme speed as cheetahs are, but hunt in packs. This is unusual in cats. The females usually do the hunting for the pride. However the males can sometimes help if needed, to take down large animals. After lions have brought down a prey, they suffocate it by biting the front of its face to prevent it breathing. Lions also have long retractable claws which act like grappling hooks, to keep hold of the prey. Even though a lion is good at killing prey for food, they are not among the most dangerous animals for humans. A lioness is ready to have young when she is 2–3 years old. Baby lions are called cubs. Cubs are born after 3 1/2 months. The cubs are born blind; their eyes do not open until they are about a week old, and cannot see well until they are about two weeks old. Lions do not have a den (home) where they would live for a long time. The lioness conceals the cubs in thick bush, gullies, or rocky outcrops. If the hiding place has been seen by other predators, then the lioness will move the cubs to a new hiding place. The cubs will be introduced to the pride at about 6 weeks old. The cubs are very vulnerable when the lioness goes out to hunt and needs to leave the cubs behind. Also, when a new male takes over a pride from another male, he usually kills all of the cubs. The cubs' mothers will then mate with the new pride male, which means that the first batch of new cubs will be his offspring. A litter of 2-6 cubs are born. Usually, only 1-2 cubs survive until introduced to the pride, at which point they are protected by the whole pride. In zoos, lions have been known to breed with tigers. If the parents are a male lion and a female tiger, the offspring is called a liger. If the parents are a male tiger and a female lion, the offspring is called a tigon. Lions appear in heraldry more often than any other animal. They traditionally symbolise courage, valour and royalty. ↑ 2.0 2.1 Bauer, H.; Packer, C.; Funston, P.F. ; Henschel, P.; Nowell, K. (2016). "Panthera leo". IUCN Red List of Threatened Species. Version 2017-3. International Union for Conservation of Nature. ↑ 3.0 3.1 Nowak, Ronald M. (1999). Walker's Mammals of the World. Baltimore: Johns Hopkins University Press. ISBN 0-8018-5789-9. ↑ Smuts, G.L. (1982). Lion. Johannesburg: Macmillian. p. 231. ISBN 0-86954-122-6. ↑ > "Behavior and Diet". African Wildlife Foundation website. African Wildlife Foundation. 1996. Retrieved 14 June 2015. ↑ "Gir National Park Website". www.girforest.in. Retrieved 2018-05-07. ↑ "Top 10 Most Dangerous Animals In The World". Conservation Institute. 28 April 2015. Retrieved 24 October 2015. Nowell & Bauer (2004). Panthera leo. 2006 IUCN Red List of Threatened Species. IUCN 2006. Retrieved on 11 May 2006. Wikispecies has information on: Lion. This page was last changed on 7 April 2019, at 19:48.